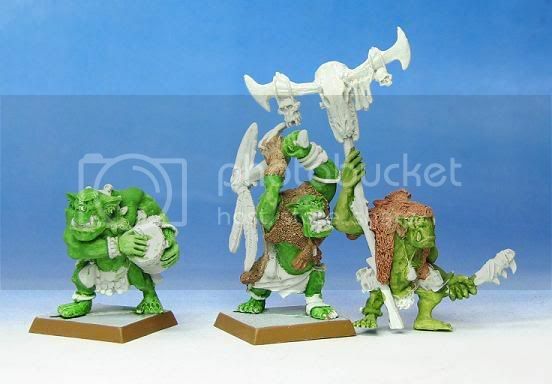 Here are the beginnings of some Savage Orc Command models for Warhammer Fantasy. I wasn't a big fan of the more recent O&G designs, but these guys aren't bad. At least they're wearing an animal... Wish I could pull this look off around work. These were actually begun with the leftover paint in the tray from the big fella below. I'm not a big fan of this model and initially bought the new kit for some of the other plastic parts on the sprue, but after taking a closer look, I decided on a master plan that has now been set in motion.... Mwu ha ha ha ha. 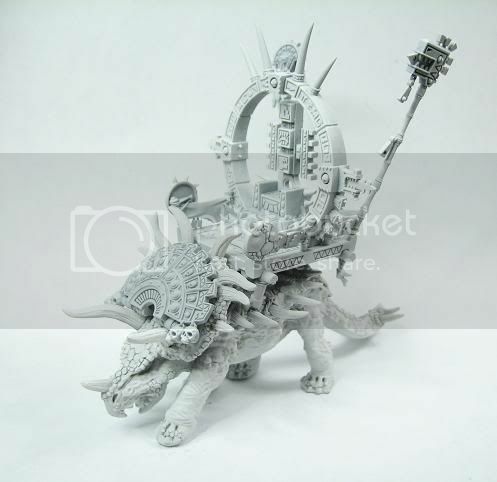 This is a shot of my converted Stegadon after the first couple of washes. Extensive putty work was done to add length to the legs so that this fine gentleman will be rearing up off his base. The head and neck was also heavily altered so that the face is turned outward in a more dramatic pose. I'm going to incorporate pieces of both the old and new howdah to finish this guy. Big plans... stay tuned! You can see how keeping your paints thin in the first few initial washes really helps start building a nice tonality to the piece. The recessed areas take in more paint and become shadowed; this needs to be carefully controlled while applying though or there will be a mess! 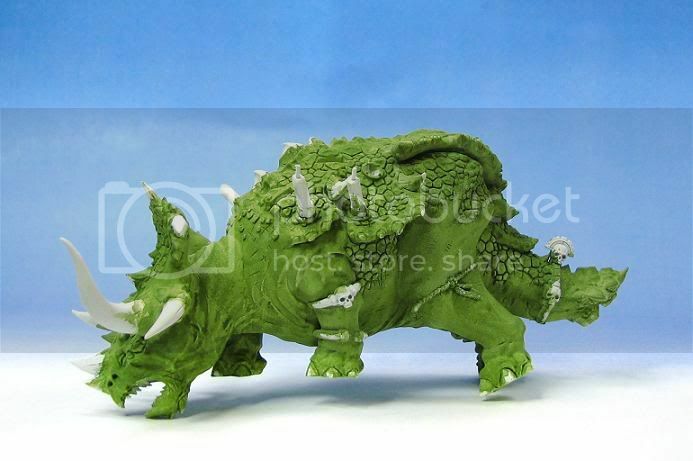 My previous edition Stegadon is readied for some serious painting as well. I liked the look of some of the new kit's parts on him, so here's a converted Engine of the Gods Design. I liked the look of some of the new kit's parts on him, so here's a converted Engine of the Gods Design.